Eeeeeeek! When Giant Centipedes Attack! OK, OK, they weren’t really attacking anyone. And, strictly speaking, there was only…..oh, say….about….er…….one. 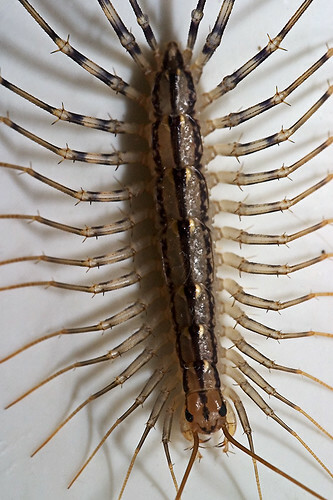 But it was the BIGGEST house centipede I have ever (evar!) seen. You could feed a family of four off its meaty thighs, I tell ya (should you, you know, desire to eat centipede legs). It didn’t even run away when I picked up the box it had been hiding under off the kitchen counter (no, I did the running away). Seriously, you could have put a saddle on this fella and ridden him away. He eventually got tired of hearing my whimpering and stalked off (the ground shook!) under the cabinets. Ok, I really like the idea of having a moss lawn that you don’t have to mow…trouble is, not all parts of our lawn are shady. And I will have to check to see if the city has any regulations against this, too (they are BIG on restrictions around here). Actually, it would be cool to make a tardigrade puppet for story times…hmmmm. Take a look at this picture and tell me that doesn’t look like a Muppet. Finally, you really should take a peek at this video since you get to see a water bear wearing a scarf!